Here are some typical processes used to enhance the clarity of a diamond. #1- Laser drilling- This process uses a laser to precisely drill down into a diamond to get access to a diamond inclusion. The inclusion is dark in color against the bright background of all the white light being returned back up through the diamond, so the diamond inclusion would be very noticeable. Upon reaching the inclusion, the heat from the laser will many times vaporize the inclusion. A special cleaning solution might be needed in order to bleach out the inclusion so that after the treatment it will be a light colored inclusion against a bright background. Because of the reduced contrast between the now lightly colored inclusion and its background, the clarity grade of this clarity enhanced diamond will be improved. Laser drill holes themselves are extremely small and you’ll need high magnification in order to see them. #2 Fracture Filling- Now this process presents a whole bunch of concerns! This is the same process that is used when you get a crack in your windshield. A liquid is forced into the crack (fracture) and just like magic… it disappears! It can be difficult to detect, even by people who you think should know what to look for…. Normally a purple to orange flash can be seen when the stone is turned and light is reflected off of the area that has the fracture filling. The liquid that is used is a glass-like material which has similar optical properties to that of diamond. The fracture that is being filled must reach the surface of the diamond. 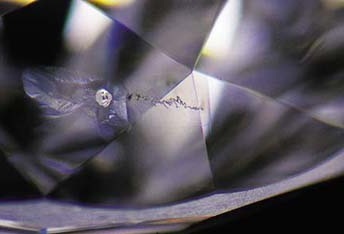 Some clarity enhanced diamonds could have been laser drilled and then fracture filled. The biggest problem that this treatment presents is when a piece of jewelry that one of these fracture filled clarity enhanced diamonds is set into will need any type of repair work. Heat from a torch (it will burn up the fracture filling material), excessive pressure in the wrong place, and the ultrasonic cleaning machines with strong cleaning solutions have the possibility of totally screwing up the stone! If the jeweler knows ahead of time that they will be working on a fracture filled clarity enhanced diamond, then these problems can be avoided. Fracture filling is NOT a permanent treatment. Fracture filled clarity enhanced diamonds, because of their possible fragile nature, will usually be best suited for use in diamond earrings, a diamond pendant, a lapel pin, etc… setting it in a diamond ring, a diamond bracelet, or cufflinks would exposed it to a lot of heavy duty wear and tear. Any piece of diamond jewelry that is worn on you fingers or wrists can really get banged around!